Please note: Unless otherwise indicated, the pictures on this web site are my property, and should not be used by anyone without crediting the source. Not to be outdone by their gun-making competitors at Holland & Holland, Westley Richards introduced their own versions of the Paradox guns and cartridges and named them the Explora and the Fauneta. 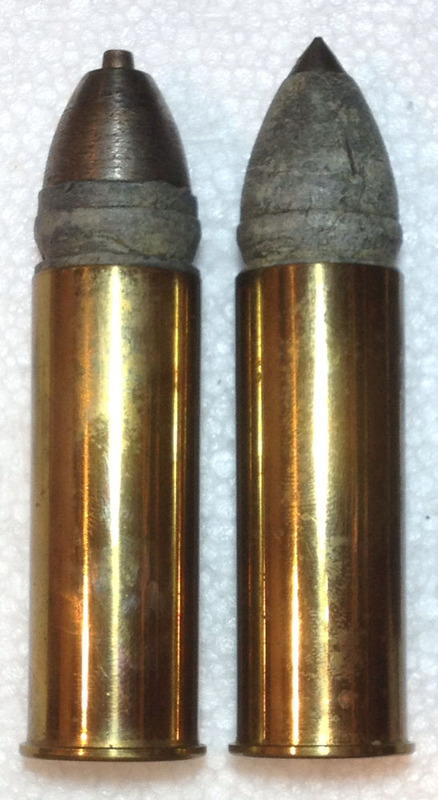 These cartridges utilized a lead bullet with an attached cone-shaped hollow brass cap, as shown in the sectioned bullet to the right. This bullet, referred to as the L.T. 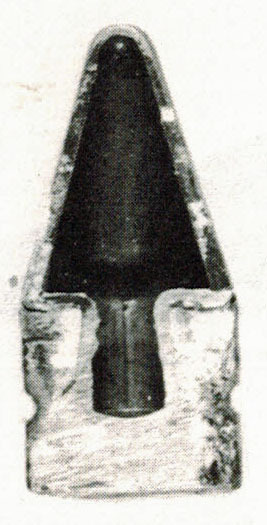 pointed bullet, was patented by Lesley Taylor. 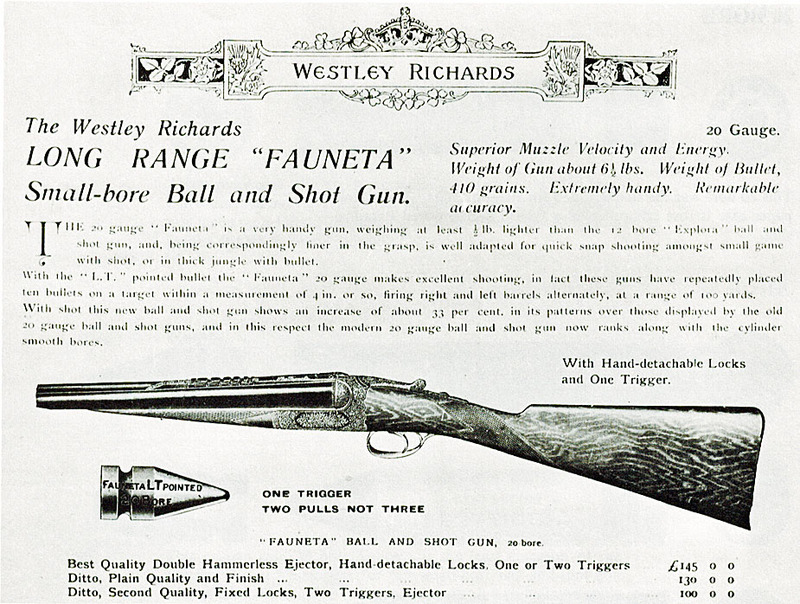 The patent was assigned to Westley Richards, the long-time employer of Mr. Taylor. The brass caps on the bullets were marked boldly around their lower circumferences 'WESTLEY RICHARDS' with the appropriate British patent number. The two Westley Richards cartridges shown here are a brass-hulled 12 gauge Super Magnum Explora on the left and a red paper-hulled 20 gauge Fauneta on the right. 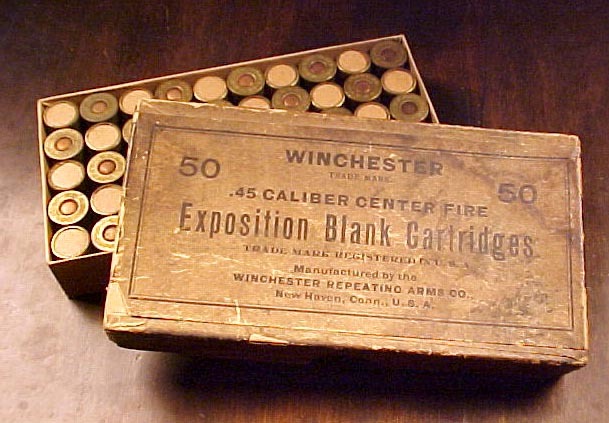 The Explora cartridge with it's proprietary 'Westley Richards' head stamp, was probably made by Eley or Kynoch in the early 1920s. The Fauneta cartridge has the ELEY NOBEL head stamp that was in use from 1924 to 1927. The Wesley Richards Explora, Super Magnum Explora, and Fauneta double barrel guns utilized rifling at their muzzles like Holland's Paradox gun. 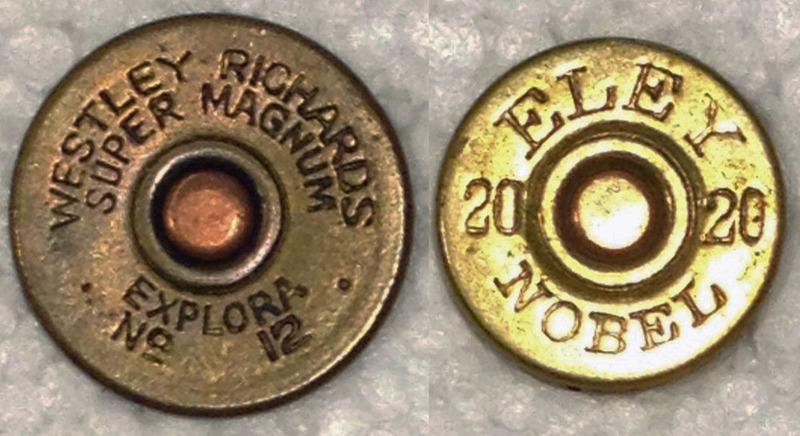 The Explora was chambered for a cartridge loaded in a 2 1/2" shell; the Super Magnum Explora was chambered for a 2 3/4" shell with a heavier charge. 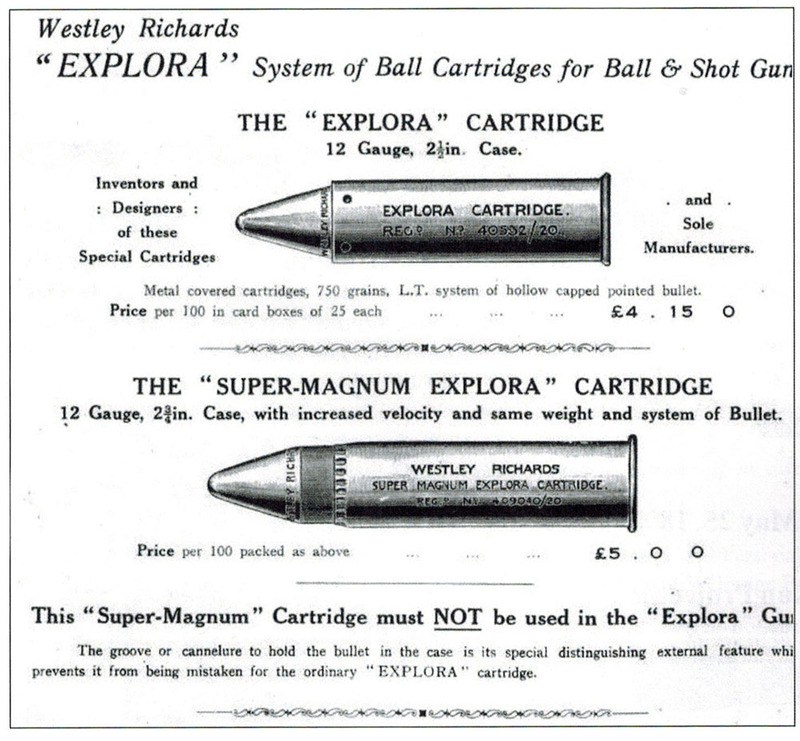 Boxes of the Super Magnum cartridges included a warning on the labels stating 'These Super Magnum cartridges must not be used in the Explora gun', suggesting that the 2 3/4" magnum cartridges would chamber in the Explora. An advertisement for the Explora cartridges is shown below. Note that the ad indicates that the groove or cannelure (the punch marks around the case mouth) holds the bullet in the case and prevents the the Super Magnum Explora cartridge from being mistaken for the ordinary Explora cartridge. An advertisement for the Fauneta shell is also shown below. 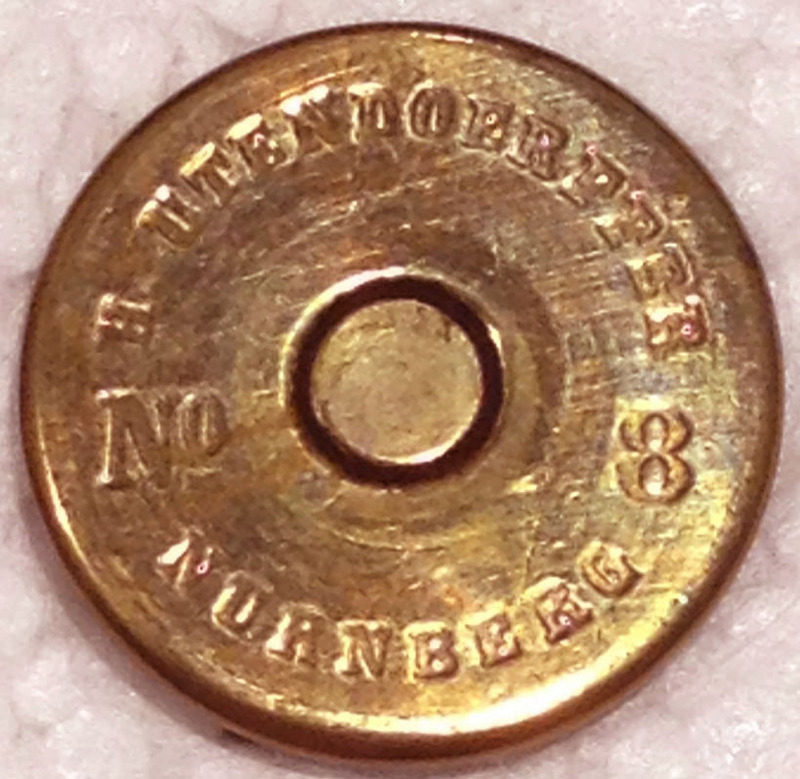 The H. (Heinricht) Utendoerffer ammunition manufacturing company was formed in 1856. In 1889, Utendoerffer was taken over by RWS, but the 'H. Utendoerffer' head stamp continued to be used into the 1920s. Both cartridges have the head stamp shown here. Explora advertisement: IAA Journal, Issue 481, Sept/Oct 2011, pg 38, Jim Buchanan. H. Utendoerffer 'explosive bullet information: Robert T. Buttweiler's Volume XII, Number 3 Collector's Ammunition, March 20, 1999, Lot 704.